1. What is end-to-end testing? Answer: Similar to system testing, the *macro* end of the test scale is testing a complete application in a situation that mimics real world use, such as interacting with a database, using network communication, or interacting with other hardware, application, or system. 2. What is security/penetration testing? Answer: Security/penetration testing is testing how well the system is protected against unauthorized internal or external access, or willful damage. This type of testing usually requires sophisticated testing techniques. 3. What is recovery/error testing? Answer: Recovery/error testing is testing how well a system recovers from crashes, hardware failures, or other catastrophic problems. 4. What is compatibility testing? Answer: Compatibility testing is testing how well software performs in a particular hardware, software, operating system, or network environment. 5. What is comparison testing? Answer: Comparison testing is testing that compares software weaknesses and strengths to those of competitors’ products. 6. What is acceptance testing? Answer: Acceptance testing is black box testing that gives the client/customer/project manager the opportunity to verify the system functionality and usability prior to the system being released to production. The acceptance test is the responsibility of the client/customer or project manager, however, it is conducted with the full support of the project team. The test team also works with the client/customer/project manager to develop the acceptance criteria. 7. What is a Test/QA Team Lead? Answer: The Test/QA Team Lead coordinates the testing activity, communicates testing status to management and manages the test team. 8. What is software testing methodology? 3. Executing tests. This methodology can be used and molded to your organization’s needs. Rob Davis believes that using this methodology is important in the development and in ongoing maintenance of his customers’ applications. 9. What is the general testing process? Answer: The general testing process is the creation of a test strategy (which sometimes includes the creation of test cases), creation of a test plan/design (which usually includes test cases and test procedures) and the execution of tests. 10. How do you create a test strategy? A description of the required hardware and software components, including test tools. This information comes from the test environment, including test tool data. A description of roles and responsibilities of the resources required for the test and schedule constraints. This information comes from man-hours and schedules. Testing methodology. This is based on known standards. Functional and technical requirements of the application. This information comes from requirements, change request, technical and functional design documents. An approved and signed off test strategy document, test plan, including test cases. Testing issues requiring resolution. Usually this requires additional negotiation at the project management level. 11. How do you create a test plan/design? Test cases and scenarios are designed to represent both typical and unusual situations that may occur in the application. Test engineers define unit test requirements and unit test cases. Test engineers also execute unit test cases. It is the test team that, with assistance of developers and clients, develops test cases and scenarios for integration and system testing. Test scenarios are executed through the use of test procedures or scripts. Test procedures or scripts define a series of steps necessary to perform one or more test scenarios. Test procedures or scripts include the specific data that will be used for testing the process or transaction. Test procedures or scripts may cover multiple test scenarios. Test scripts are mapped back to the requirements and traceability matrices are used to ensure each test is within scope. Test data is captured and base lined, prior to testing. This data serves as the foundation for unit and system testing and used to exercise system functionality in a controlled environment. Some output data is also base-lined for future comparison. Base-lined data is used to support future application maintenance via regression testing. A pretest meeting is held to assess the readiness of the application and the environment and data to be tested. A test readiness document is created to indicate the status of the entrance criteria of the release. Test tools, or automated test tools, if applicable. Previously developed scripts, if applicable. Test documentation problems uncovered as a result of testing. A good understanding of software complexity and module path coverage, derived from general and detailed design documents, e.g. software design document, source code and software complexity data. Approved documents of test scenarios, test cases, test conditions and test data. Reports of software design issues, given to software developers for correction. 12. How do you execute tests? Answer: Execution of tests is completed by following the test documents in a methodical manner. As each test procedure is performed, an entry is recorded in a test execution log to note the execution of the procedure and whether or not the test procedure uncovered any defects. Checkpoint meetings are held throughout the execution phase. Checkpoint meetings are held daily, if required, to address and discuss testing issues, status and activities. The output from the execution of test procedures is known as test results. Test results are evaluated by test engineers to determine whether the expected results have been obtained. All discrepancies/anomalies are logged and discussed with the software team lead, hardware test lead, programmers, software engineers and documented for further investigation and resolution. Every company has a different process for logging and reporting bugs/defects uncovered during testing. A pass/fail criteria is used to determine the severity of a problem, and results are recorded in a test summary report. The severity of a problem, found during system testing, is defined in accordance to the customer’s risk assessment and recorded in their selected tracking tool. Proposed fixes are delivered to the testing environment, based on the severity of the problem. Fixes are regression tested and flawless fixes are migrated to a new baseline. Following completion of the test, members of the test team prepare a summary report. The summary report is reviewed by the Project Manager, Software QA Manager and/or Test Team Lead. After a particular level of testing has been certified, it is the responsibility of the Configuration Manager to coordinate the migration of the release software components to the next test level, as documented in the Configuration Management Plan. The software is only migrated to the production environment after the Project Manager’s formal acceptance. 13. What testing approaches can you tell me about? 14. How do you divide the application into different sections to create scripts? Answer: First of all, the application is divided in different parts when a business analyst writes the requirement document (or Use Cases or Design Document), he/she writes EACH requirement document for EACH module. Let us say, if there are 12 different modules in an application that a business analyst has written the requirements for, then a tester would write the test cases for each module, which means in 12 different sections. This is the standard practice. There might be scenarios where you might have to break down scripts into sub-categories. For example, if a tester is writing a script for Login Page, he/she might write one for positive and negative testing and another sub-set of test cases would be for error message when the wrong information is entered. In short, the test cases are divided according to the modules. 15. What is your goal? 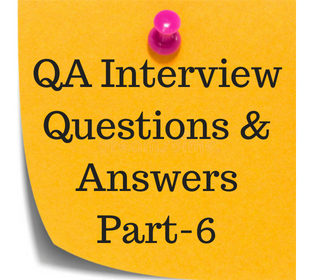 Answer: My goal is to be QA Lead (or QA Manager) in near future.